The last time I held a free book giveaway here at TOCWOC – A Civil War Blog, users had to answer a question with a lengthy essay. In other words, there was a lot of work involved for you the reader. I’m pleased to announce that this particular contest is much, much simpler. I’ve decided to make this post as clear as possible so there are no surprises by using a sort of FAQ style. What Do I Have to Do to Enter? : All you have to do is subscribe to TOCWOC via email sometime between the day this post went live and the end of the day on March 31, 2009 (11:59 PM Central U.S. time) and remain subscribed until when the new email subscribers are counted and a name is drawn on Saturday, April 4, 2009. How Do I Subscribe to TOCWOC via Email? : This one is easy and will only take a few minutes! Simply enter your email address in the form over in the right sidebar and left click on the “Subscribe” button. You should be asked to correctly type in the letters displayed in a “Captcha” style image. Once you have done so, you will be sent an email. Left click on the link provided and you will be a TOCWOC email subscriber. It’s that simple. What If I Do Not Follow Those Instructions? : If a prospective contestant does not follow through fully with becoming an active TOCWOC email subscriber, they will not be entered into the drawing. No exceptions. How Do I Know I’m an Active Subscriber? : You will know you are an active TOCWOC email subscriber once you begin receiving emails containing TOCWOC blog entries. This indicates you are signed up for a chance to win the free book as long as you remain subscribed until after the drawing has taken place in early April 2009. Why Are You Doing This? : The publisher sent me an extra copy of the book and I decided to reward TOCWOC’s readers with a chance to win it. What’s In It For Me (The Reader)? : You will be entered in a drawing for a chance to win a FREE book without hardly having to do anything at all. It shouldn’t take more than a minute of your time to become a TOCWOC email subscriber. I Live in Zimbabwe. Will You Ship the Book to Me? : Unfortunately I cannot. Due to shipping costs, I will only be shipping to mailing addresses in the lower 48 United States. All others are ineligible for this contest. I won’t tell you no if you do decide to go ahead and subscribe to TOCWOC via a feed reader or by email though! I Am A Civil War Blogger. Can I Enter the Contest? : Sure! As long as you have a mailing address in the lower 48 United States, anyone can feel free to sign up. I Am Already Signed Up As An Active TOCWOC Email Subscriber. Can I Enter? : Absolutely! Simply use the TOCWOC Contact Us form to let us know you are interested in being entered into the drawing prior to the end of the day on March 31, 2009. How Will You Ship the Book? : The book will be shipped using Media Mail. Insurance or tracking of some kind will be used. Any Other Rules? : The drawing will be held by Brett Schulte. The winning contestant will be contacted and asked for a mailing address at the email address they used to subscribe to TOCWOC. As long as that mailing address is in the lower 48 United States, that person will be announced as the winning contestant by Brett Schulte on April 4, 2009. All decisions are final and are made at the discretion of Brett Schulte. The Civil War’s single-shot, muzzle-loading musket revolutionized warfare-or so we’ve been told for years. 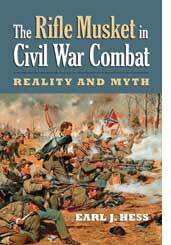 Noted historian Earl J. Hess forcefully challenges that claim, offering a new, clear-eyed, and convincing assessment of the rifle musket’s actual performance on the battlefield and its impact on the course of the Civil War. Many contemporaries were impressed with the new weapon’s increased range of 500 yards, compared to the smoothbore musket’s range of 100 yards, and assumed that the rifle was a major factor in prolonging the Civil War. Historians have also assumed that the weapon dramatically increased casualty rates, made decisive victories rare, and relegated cavalry and artillery to far lesser roles than they played in smoothbore battles. Hess presents a completely new assessment of the rifle musket, contending that its impact was much more limited than previously supposed and was confined primarily to marginal operations such as skirmishing and sniping. He argues further that its potential to alter battle line operations was virtually nullified by inadequate training, soldiers’ preference for short-range firing, and the difficulty of seeing the enemy at a distance. He notes that bullets fired from the new musket followed a parabolic trajectory unlike those fired from smoothbores; at mid-range, those rifle balls flew well above the enemy, creating two killing zones between which troops could operate untouched. He also presents the most complete discussion to date of the development of skirmishing and sniping in the Civil War. So what are you waiting for? Join the contest, win a chance to get a free book, and look forward to fresh TOCWOC content in your inbox! So, what if I subscribe via my RSS Aggregator? Sorry, that won’t get you entered. This one is specifically for email RSS subscriptions. I wish I would have known earlier that you received an extra copy, as I am hoping to get one to use for a paper in a class on material culture. Could you send me the email contact you have at the publisher so I can request a review copy? The copy was specifically meant to be used as a contest giveaway. I sent you an email with the proper contact info. Thanks Brett. BTW, I hope you are enjoying the warmer weather, we are going to have a blizzard tomorrow up here in ND. Can’t wait for the Cards season opener. Man I miss STL. Take care.